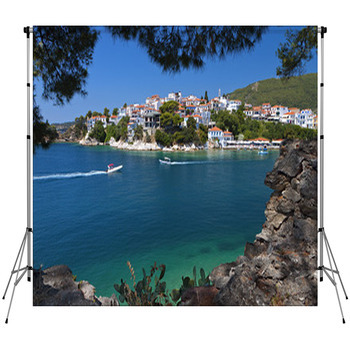 Explore the charming islands of the Mediterranean with our vibrant Greek backdrops. This enchanting land captivates us with its rich, mysterious history and incredible displays of natural beauty. 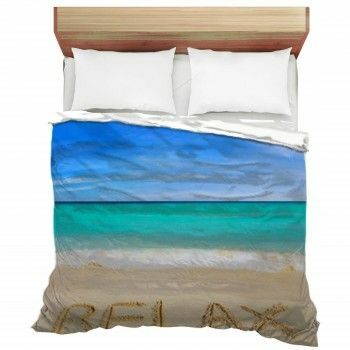 Sail the sapphire seas of Ulysses and climb the craggy Mt. 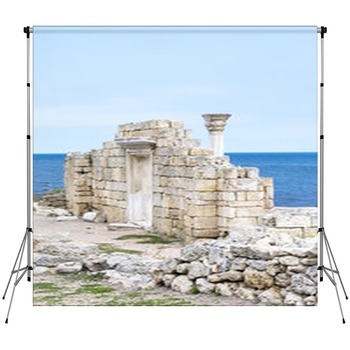 Olympus with our collection of portable photo backdrops showing all the most magical settings and scenes of the Greek Isles. Aspects of Greek culture can be found all around us, from the alabaster columns of the white house to Disney's animated film Hercules. Indulge in your love for the unique Greek aesthetic with its timeless marbled statues and polished temples that look down on sun-soaked crystalline waters and golden beaches. 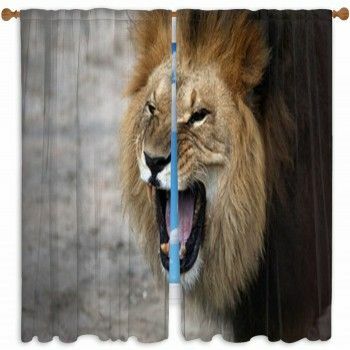 Our custom size backdrops are your gateway to the mystic world of Greek myth and its incredible history. 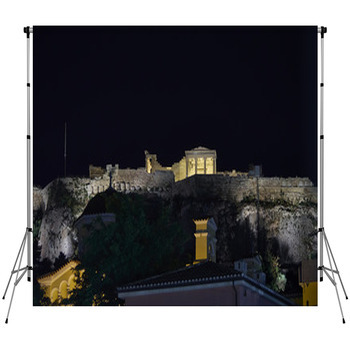 Pose your portraits and photo shoots against the breathtaking Parthenon ruins as they sit peacefully for centuries underneath the hot Mediterranean sun. 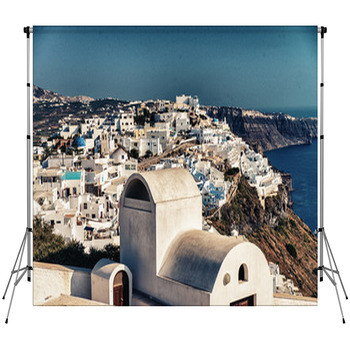 Perch them upon the alabaster white buildings of Santorini, known as perhaps the worlds most desired tourist destination. Enormous marble statues of Plato and Socrates sit beside images of the great Greek gods and regal goddesses. 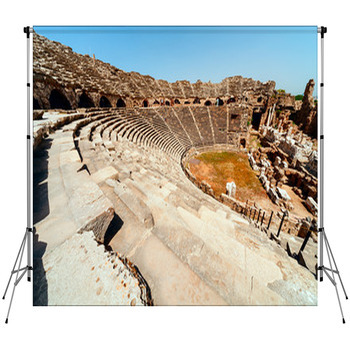 Alongside our charming photographs of Greeks settings, we have gorgeous images of classic Greek artwork and ancient artifacts. 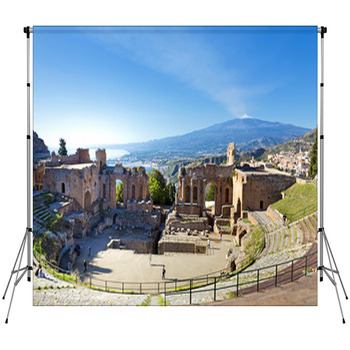 Make sure you have the right backdrop for your next Greek wedding or Greek family reunion. 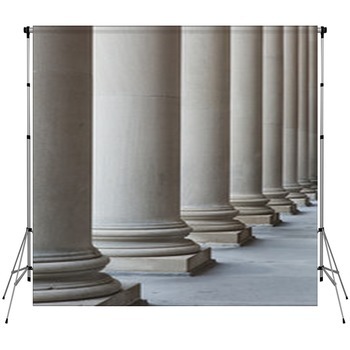 These portable photographer backdrops can be instantly personalized when you add your own custom text. 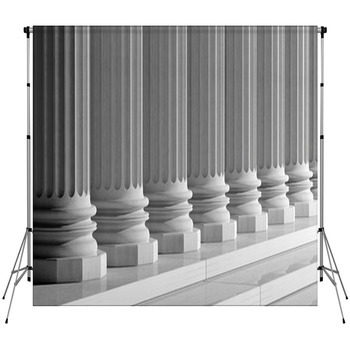 Print the family name or a special Greek message on your portable backdrop to create a stunning unique setting for family portraits or wedding photos. 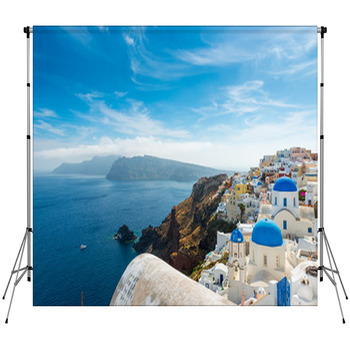 To give your next event a professional look, match your backdrop with our complementing Greek themed wall murals, fabric and home decor to truly impress. 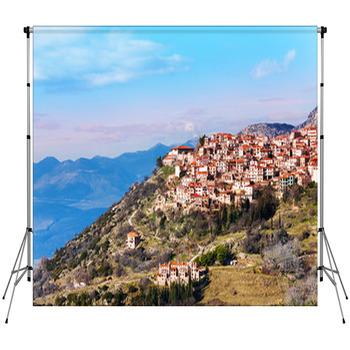 Although the golden Mediterranean is seemingly far away, you can reproduce its charm anywhere you like with our enchanting and portable backdrops.